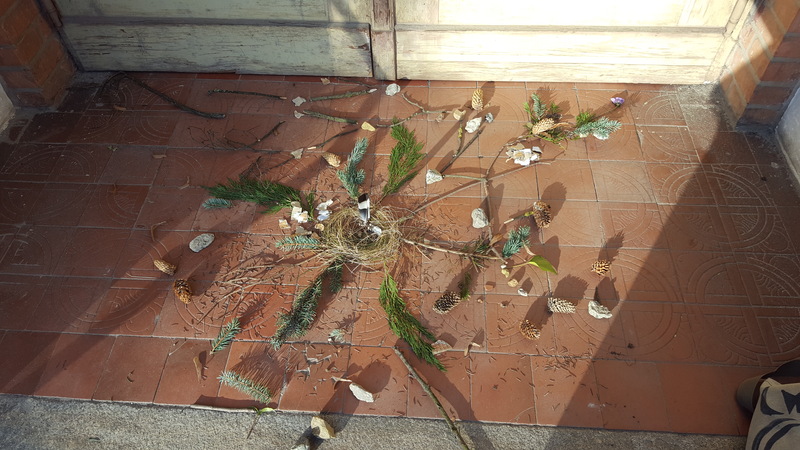 It was a bright spring afternoon last April, and here I was with Simoon Fransen from the Netherlands and Chelsea Lei from the USA in a Berlin graveyard, creating a 3D sculpture of the u.lab system out of twigs, pine cones and other stuff foraged from nearby. We were nearing the end of the Presencing Institute’s first Advanced Facilitation Programme and it struck us that we had never looked at u.lab in this way before. As the sculpture took shape on the doorstep of the church, a clear and extremely important acupuncture point jumped out. The u.lab hub hosts – the people who stepped forward to volunteer to hold a space for a group to learn and practice together. While there was already some support in place, this role was relatively new and unexplored. What else might be helpful at this point? What does it feel like to host a u.lab hub? What experience, skills, ways of being are helpful? Simoon and I drew on our own experience of hosting and reflected on what would have been helpful for us. A clear prototype came to mind of a space to be with others with a similar intention to host a hub and practice and learn from each other. With the deep sensing we had been doing since the end of u.lab 2016 and the space the programme afforded us, we quickly moved into action. Nice Lazpita, a linchpin for the hubs in the Basque Country, came up to us at the very end of the programme and told us he wanted to help. 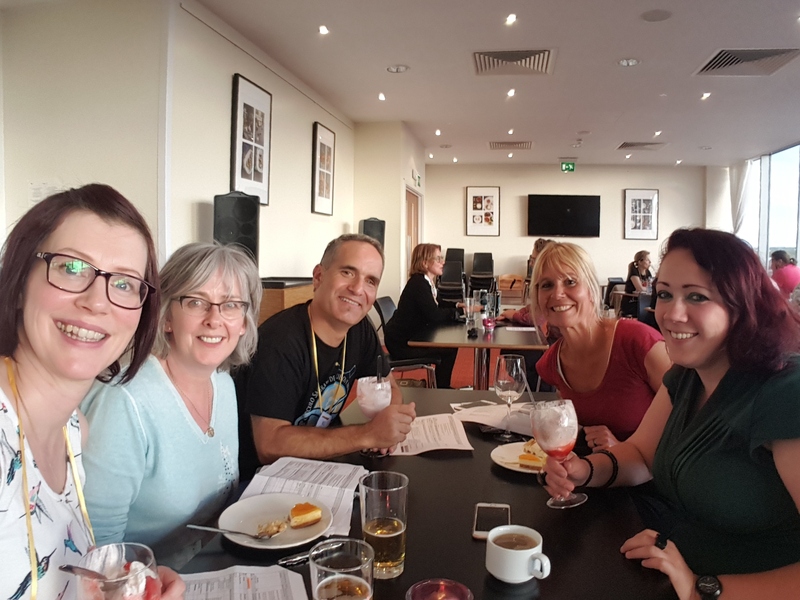 So we had our first call a few days later, where I brought in Valerie Jackman who hosted the Edinburgh College hub in 2016 and again in 2017, and Simoon invited Nuala Burns who she had worked with on u.lab in the Netherlands. Valerie suggested Edinburgh College Milton Road Campus as a venue, with its amazing cafeteria space and restaurant and, if we held it towards the end of June, the student accommodation would also be available. All of a sudden, we were a core team of five with a programme date set less than 3 months away. I’ll admit, the speed in which it was all coming together scared the hell out of me! But it felt like the right thing to do at the same time so I stuck with it, quieting my voice of fear. Other than myself, who is fortunate enough to support u.lab in my job, everyone else was volunteering their time and expertise so we scheduled regular Zoom calls in the evenings and got to work. We tested the level of interest for such a programme within the u.lab global community and felt there was enough to proceed. Within a few weeks of advertising through our networks, we were nearly at capacity. The logistics of how to organise and pay for a programme like this took up an extraordinary amount of time. However, we recognised how important these factors are in creating an environment conducive to learning. 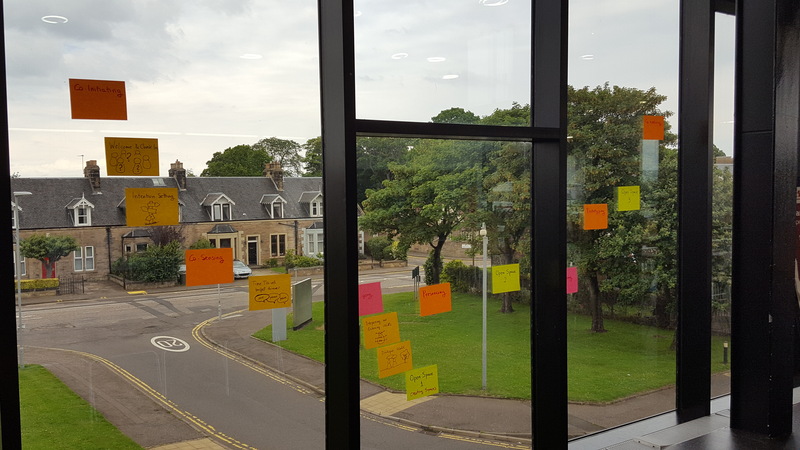 We kept focused on our strong intention of creating a programme where we would host a hub of hub hosts, creating space for them to learn together. In what felt like the blink of an eye, the date arrived and we welcomed over 50 hub hosts to Edinburgh. Half were from Scotland and the other half came from all over Europe and as far away as Uruguay! Over the next two and a half days, we explored areas such as our collective intention, what kind of space we each wanted to create, how we might design our hubs and how we might look after ourselves while hosting. The atmosphere was just delightful and it was inspiring to watch friendships form that would last beyond the programme. As we all perhaps experience in u.lab, it’s these kind of spaces with quality time to learn, practice and reflect that we often feel starved of. 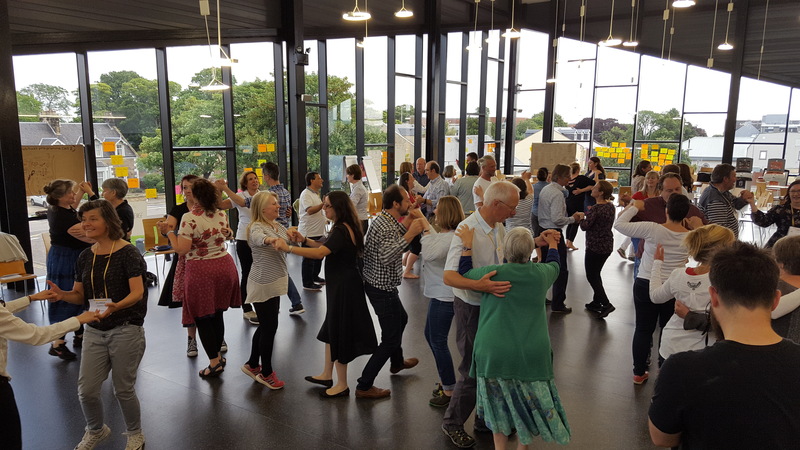 The feedback we received was very positive and initial findings in the research we are doing on u.lab in Scotland indicate that the programme had a profound and positive affect on people’s confidence and ability to host hubs in 2017. And we, as a core team, learned sooooooo much in the process, both about ourselves and what we could improve upon. The level of trust in each other that built up so quickly was astounding, particularly as I was the only person in our group who had ever been in the same room with everyone in the team! I think this helped keep us calm – we trusted in each other to provide the best experience we could – and ensured we thoroughly enjoyed the process. Which I think is the magic ingredient to hosting. So having tested the idea, we are hosting the programme again. This time in April, to give participants more time to act on their design plans. The Scottish Government will again sponsor participants with the intention to host a hub in Scotland. A notable difference this year is the interest we are receiving from hosting teams to attend. This might be an indication of more intentional and connected local support forming. We are already seeing this in Scotland too. We are open to what might emerge as a result of this programme, perhaps a different form of hub host support in the future, who knows. But for now, there are still spaces on the 12 to 14 April programme in Edinburgh. If you have intentions to host a hub this year, why not come join us?